Take the helm of your own capital star ship and enter intense, team-based space battles. 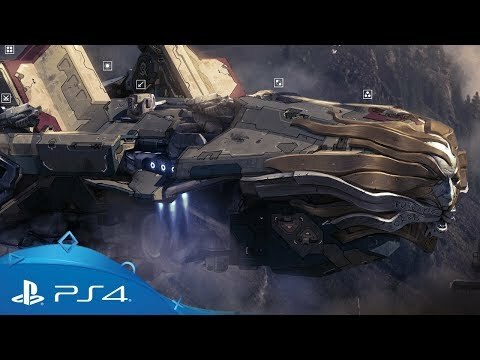 Be the commander of your own dreadnought-class ship and coordinate with allies online to win decisive victories in the depths of outer space and across the skies of alien worlds. Unlock and customize over fifty different ships from three distinct manufacturers, adding weapons, modules, decals and coatings to build your own indomitable military vessel. Every fleet needs a diverse team, so build carefully to suit your role: are you pure assault, reliable support or a cunning scout? Victory belongs to those who fight together, making team work crucial. Master your role and work tactically with the rest of your team to deliver crushing victories, scupper enemy star ships and unlock new features, craft and options for your own fleet. Collaborate with your team via voice chat, equip the new aim assist feature for easier Corvette hunting and show off your skills by collecting the complete trophy set. You can also pursue 'daily win' rewards, which will enable you to earn up to three extra bonuses every day and, finally, we've added Havoc maps that look better than ever. Design ships according to your own playstyle, customising every aspect of the vessel, from weapons and modules to coatings and decals. Unlock over 50 ships across five different classes and find your role as either a heavy, assault, scout, sniper or support - or even master them all. Claim victory by working together, making the most of your team's strengths and exploting your enemies' weaknesses. Ultimately, success belong to those who work together as one. Tackle opponents in competitive, tactical mutliplayer matches. Fight to build a reputation, earn new ships and unlocked advanced options that will make your vessel your own. Enter a new battlefield and hold your ground in a team-based mode that challenges you to fight off waves of increasingly-powerful enemies, upgrading your ships between each round. Find your own way in a scale recreation of the Milky Way galaxy in Elite: Dangerous on PS4. Explore the almost infinite universe created by Sean Murray and Hello games - available on PlayStation 4.